Where does the time go?? I can't believe it's already June and time for the Creative Team Reveal here at Scrap Shotz. This month's kit Craft DIY is just FULL of American Crafts goodness! The Craft Fair line is so bright and fun and the CT did a wonderful job showcasing this awesome kit. Make sure you check out the gallery on Tuesday, June 2nd for the full Creative Team Reveal. For now, here is just a sampling of all the gorgeous goodness. Yup, that's right, today is the start of our fabulous Industry Insider Online Crop. Make sure you join us at 8pm EST (5pm PST) for the kick-off. There are great challenges, fun games and awesome prizes!!! And, if you're already raring to go, you can check out our SSZ Gives Back Challenge which is already posted. Every crop Scrap Shotz has a challenge for charity. 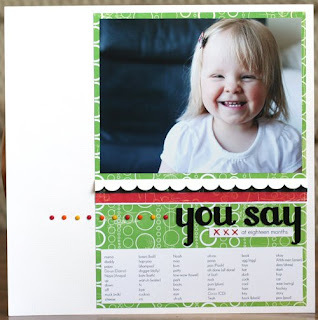 For every layout or card created for this challenge SSZ donates $5. This crop's charity is the Canadian Diabetes Association. So, to wet your appetite and get you excited for tonight, here are some sneak peeks of some of the challenges the Creative Team has instore for you. Well today I decided to spotlight one of the layouts that was done for my monthly CT challenge posted in the forum. The goal this time was to incorporate a layered photo collage into a layout or card and this one by Catharine definitely fit the bill! I love the collage, and even more love the fact that it was a tough challenge for Catharine and really got her thinking outside her comfort zone! Looks like it all worked out! The layout is gorgeous and Catharine got to try something new! I challenge all you blog readers out there to head to the forum and try one of the CT ideas to get you thinking outside the box! Nowadays it seems like everyone has a blog (except Jess). :P I love blogs (and the size of my google reader can attest to that). I love staying connected with people, eying other people's scrapping projects, looking at gorgeous photos, finding inspiration in the neatest places. Lately, I've been trying to use my blog as a journal (which really is what it's supposed to be after all) to hold stories that are waiting to make it onto scrapbook pages. It seems like I have a bit more time to write things down these days than I actually do to scrapbook (and with how forgetful I am, I can't trust my memory all the time). I love that when I'm actually ready to do a layout, all I have to do is copy and paste the journaling and print it and it's all done for me. It makes the whole scrapping process so much quicker for me as journaling is what typically tastes me the most time anyways. When my daughter was 18 months old, she had quite the vocabulary and I wanted to make a list of all of the words she had at that age. I knew it was going to be a while before I could scrap it so I put it on my blog and when I was ready to scrap it I just had to copy, paste and print it. If you have a story that is waiting to make it onto a scrapbook layout, use your blog to write it down so you don't forget. It will make the layout so quick and easy when you finally are ready to scrap that story. Don't forget to pop over to the forum today to wish Sandy a HAPPY BIRTHDAY, to see the June Kit reveal, the Card Kit reveal and to participate in Scrappy Hour (the project is super cute). It's that time again, time for another awesome Scrappy Hour Project. This month the very talented Jess is hosting our Scrappy Hour. She has a great little gift, perfect for Father's Day which is coming up faster than you think. So make sure you join us at 8pm EST (5pm PST) on the message board to follow along and make this perfect gift. And to make things so much more interesting, it's also the reveal of the new June Kit and all the Add-ons will be up in the store. I've heard it's a very "Crafty" kit so make sure you check back with us tonight. Thanks carebear for making me smile! What a fun photo... great colors... and happy time! What do you think I am talking about today??? Well, I am just bursting at the seams to tell you...and having to keep it a secret the last couple of weeks has been so so SO hard! Scrap Shotz is having another fabulous online crop on May 29, 30 and 31st. And we all know the prizes are outstanding! And the challenges are super fun! To kick this celebration off, Scrap Shotz has a giveaway! Got your attention now??? Is it Captivating you right now? Scrap Shotz is giving away the paper line and 3 embellies to one lucky winner! All you have to do is spread the word on the online crop on your blog. Then come back here to leave a comment, linking us up. At the end of the month, I'll draw the name of the lucky winner from everyone that has linked us up! So spread the love near and far! Let me know if you have any questions! Who could resist this sweet little bundle? Brenda (scrapmilly) wowed us with this layout of her new granddaughter. I just love the beautiful hand cutting and all the details with pearls and a touch of bling! Be sure to check back into her gallery often... i think she'll be busy with new baby pics for a while yet! Do you make something for your mom for Mother's Day or do you buy it instead. I know I always have bought something. But now that we're all a little bit more conscious about money I'm sure that many of us will be thinking of something homemade. How perfect is our hobby then eh? I'm sure that all of us have some great ideas and could come up with some amazing presents & gifts for our mothers, our mother-in-laws, grandmas and friends. 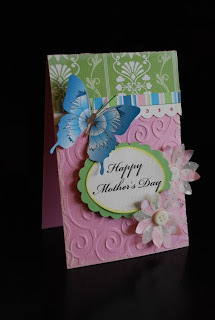 So I want to challenge you to make a card, a gift set, a layout & frame it, etc. The list can go on. And then post it in the Gallery so that we can all see your projects. You could even get your children involved in this as well. My daughter actually took a scrapbooking class last weekend and made something for me. She, of course, has hidden it on me because she wanted to save it for Mother's Day. So I'm excited to see it. I'll try to remember to post her project when I get a chance. Here's a card that I made for my mother. She's not going to be here for Mother's Day and I miss her terribly. I hope that all of you mother's out there have a wonderful day!! Well today I'd like to show you how Carolyn was workin' the Cosmo at our fantastic NSD crop! She made these beauties... doesn't it make you want to break out some of this bright fun paper? This month's kit "Positively Fetching" featuring the new Fetching line by Pink Paislee is super colourful and fun! If you are interested in subscribing to our kit program and want to start with this gorgeous kit, just click on the photo and you can begin getting our fabulous kits. So now, on to the Design Team Reveal. The DT did a fabulous job this month again with this awesome kit. It's just amazing how the same kit can come out with such different creations. The full reveal will be launched on Monday May 4th after the end of the "Open Mic" Crop. Make sure you check out the gallery for all the wonderful DT goodness. But for now, here's a sampling to wet your appetite.